In 1930, Cole Porter wrote the words and music for “I Happen to Like New York,” one of the thousands of the musical paeans to that magnificent city. 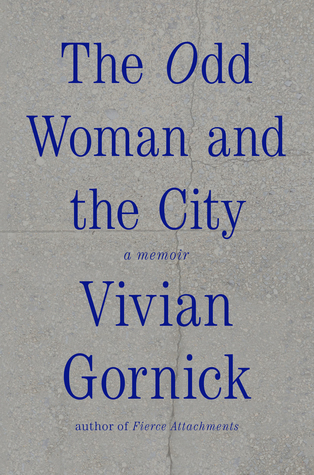 In her memoir, The Odd Woman and the City, Vivian Gornick manages to capture not just the layered tempos of Porter’s city, but the equally rich textured nature of her life in that metropolis. The images and scenes she encounters on her walks or subway rides serve as the canvas for her changes, her relationships and for her very essence, but the city never takes second place to any of them. In fact, the city seems to be the only place she feels any sense of peace. If this were a movie, Manhattan would be her co-star. It falls comfortably into the current spate of memoirs that seem to have a geographical bedrock. Andre Dubus III’s Townie, is an example, a life which could only unravel on the mean streets of East Boston. Sally Mann’s pastiche of her life in photography – Hold Still – is firmly affixed to her lifelong residency in Virginia. Both locations help to inform the lives and choices of their authors, adding color and dimension to their experience. And so it is with Gornick’s memoir. Married and divorced twice, she writes of love affairs, casual interactions and painfully incomplete friendships with a sometimes cynical, but never misanthropic, perspective. It is clear from the get-go that her real and lasting lover is New York City. She told one interviewer, “I’ve not had the life I wanted.” Like so many of her generation (she’s 80), she thought she’d end up with some version of Prince Charming. And yet, her relationships with men seem contentious and volatile; she depicts them as “a species separate from myself. Separate and foreign.” There is no mention here of any sexual liaisons with women; the bias of her generation may have precluded that option. Though the book is dotted with sexual activity, she has clearly opted for the life of the intellectual, a safe harbor away from stormy liaisons with either gender. Her most rewarding and lasting relationship with a man is with Leonard, who is gay and similarly disappointed in life’s realities. Though he appears with regularity throughout her narrative, she is reluctant to call him a friend. “What we are…is a pair of solitary travelers slogging through the country of our lives, meeting up from time to time at the outer limit to give each other border reports.” She is disdainful of the contemporary value placed on mutual disclosure. Trust is a major issue and she is reluctant to commit, seeking to avoid the inevitable disappointment. Her conversations with Leonard tend toward the ironic and existential, just an eighth note apart from one another. It is a very New York relationship, based on “high-toned” witty conversation, walks through borough parks and attendance at cultural events. Her verbal pictures of the neighborhoods in which her many adventures occur are very vivid. One can almost hear the street noise and the faint but distinct sounds of an alto sax torturing the blues. Gornick’s way with prose is alternately clever and profound. At a dinner party she attends as a reconnaissance mission for information about a friend, she writes, the hostess “wore a thick layer of anxiety over her makeup.” On another day, she runs into a hard-of-hearing acquaintance in a pharmacy and their loud discussion of sexual disillusionment leads to a captive and amused audience among others waiting for meds. The shorter metro vignettes can resonate like rim shots in a comedy club, but they are woven into a deeper fabric. Paradoxically, her most genuine interactions fall within these abbreviated and secondary associations. She seems nurtured and even reassured by them. She has a propensity for taking distracting historical detours, discussing relationships between long-dead writers, finding frequent comfort in Bartlett’s Quotations. From Emerson: “Every man alone is sincere. At the entrance of a second person, hypocrisy begins.” We already know this from her shared experiences. Gornick is an oft-published, oft-quoted writer in many genres, but it is a tribute to her and this memoir that we don’t care. Nor are we concerned about the details of her biography. After all, this isn’t her first memoir. Fierce Attachments came out back in 1987, giving her lots of time to reconsider her life. Her ability to capture her own struggles, at least the ones she describes here, is every bit as trenchant and evocative as the fine brush with which she paints her beloved city. Who needs more facts? With the short bursts of stories, asides, and broken relationships it would be easy to think of this as a mere literary pastiche lacking a through-line. While she might at times seem as Ira Gershwin has observed, “all alone in this big city,” her attachment to the urban grit, itself, is at the very core here. She continues to seek connections with others, but seems to have accepted the evanescence of relationships, in the end finding herself the best company of all. She closes the book with a brief rumination about the many people who had crossed her path that day, thinking they are all fine, if fleeting, companions. Then she realizes it’s time for her weekly meeting with Leonard. She picks up the phone to call him. We wish we could come along.